First edition indeed! Sadly it's pretty banged up, minus the dustjacket, and it has a library stamp in the front, but what the heck -- it still has that lovely onionskin (intact) paper covering the full-color illustration for the beautiful frontispiece done by Howard Chandler Christy, whose illustrations appear throughout the novel. While The Circular Staircase is her first published novel (1908), Jan Cohn, the author of Improbable Fiction: the Life of Mary Roberts Rinehart (1980) tells us that The Man in Lower Ten is Mary Roberts Rinehart's first work of "book-length fiction." She wrote it in 1905, and in 1906 it had been accepted for serialization in All-Story Magazine. Considering she'd been writing short stories for just about a year and a half, as Cohn says, "Somehow in that frantic apprenticeship she had learned all she needed to know." (35) For the serialized version of this work, Rinehart earned $400, her highest-paying story to that time. 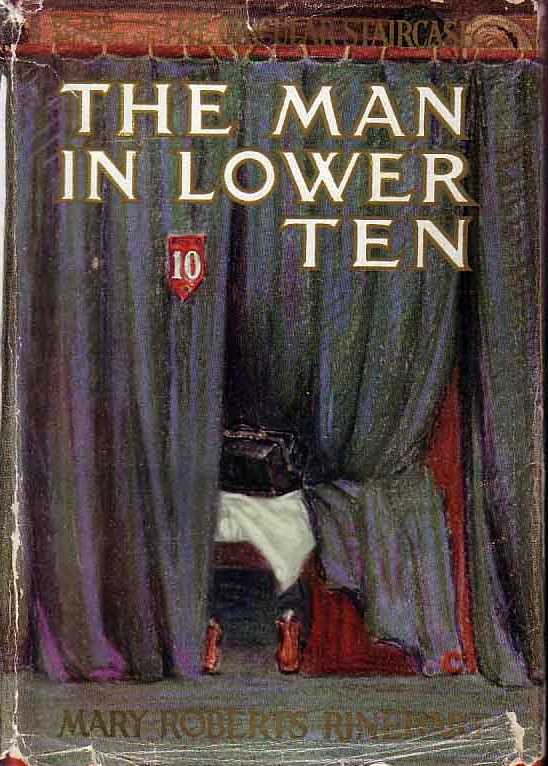 Following the publication of The Circular Staircase, The Man in Lower Ten was published as a novel, and it was so popular that it ended up on the 1909 bestseller list (thank you, Project Gutenberg). 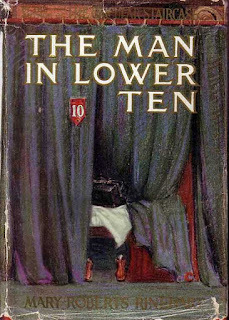 According to Simon and Schuster, The Man in Lower Ten was actually "the first detective novel to appear on national bestseller lists." The Man in Lower Ten blends mystery, humor, dark atmospheric moments and romance in the telling and ends up being a satisfying read, meaning I never guessed the "who" at any point in time although my inner armchair-detective self made several attempts. In this story, a young attorney named Lawrence Blakely recounts the "queer freak of the demons of chance" that set him off on the "most remarkable period" of his life. It all starts when his partner and long-time friend Richey McKnight begs off the procurement of some very important papers having to do with an important court case, and asks Blakely if he wouldn't do it for him. Blakely agrees, goes to Pittsburg (sic), takes a deposition, picks up the papers, and is on the return journey home when this story begins in earnest. Blakely's ticket puts in him berth Lower Ten, car seven of the train, and by the time he's ready to go to sleep, he makes his way there for a good night's rest. Imagine his surprise when he finds another man laying on his bed, sleeping soundly. The porter agrees to let him use berth Lower Nine; by this time though, Blakely isn't at all tired and gets up to wander around before returning to his bed. But there's yet another surprise for our hero -- his things are missing and he's found himself in Berth Lower Seven. But that's just the beginning, as the porter makes his way to Lower Ten and discovers that the formerly-sleeping occupant is now dead. If that's not bad enough, all of the evidence points directly to Blakely, who probably would have been arrested at the next stop, had there been one, but a deadly train wreck intervenes. Surviving the crash, Blakely must find a way not only to clear his name, but also to discover the real killer before the police have the chance to slap the cuffs on him. "the inductive method originated by Poe and followed since with such success by Conan Doyle. Have you ever read Gaboriau? Ah, you have missed a treat indeed." Even after the train wreck, he follows Blakely where ever he goes, always taking notes, and later thinking he has his man, announces that "It's a great day for modern detective methods." He turns out be wrong, but it's a great bit of tongue-in-cheek irony. My personal favorite of Rinehart's books is The Album (1933) which I read as a kid and never, ever forgot because of the whole axe-murderer thing and the mystery leading up to the identity of the killer. Since then I've probably read it about three times. While I didn't find The Man in Lower Ten to be nearly as exciting and polished as that one (which is no surprise given it's her earliest book-length work), it was still a lot of fun. The romance isn't too in your face, although I must say that Blakely spends a lot of time worrying about how to shield the reputation of the woman in the case -- how very Victorian we still are after the turn of the century here in America! I also noticed right away that there are several places where we see this country on the edge between old and modern, for instance, in the use of automobiles vs. horse carts and hansom cabs. One word of warning -- in 1905 our modern sensibilities about race were, of course, not in play, and I did get a bit of a jolt coming across words like "darky" and "Jap." All in all, it's a fun read, and had this been my first introduction to Rinehart's work, I'd probably go on to read more. 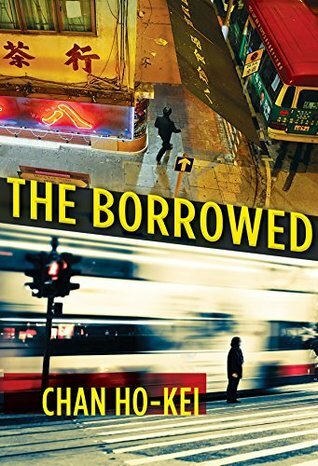 As it is, I've read several of her books so in my opinion, while the stories may seem a bit thin to modern readers, she's an American mystery novelist worth exploring. Whew! I see that my last visit here was on April 14th; in the meantime I've been to Seattle, then home for a brief visit before moving on to South Carolina for just under a week. Home now, and back to reading and I'm a happy camper. I actually finished The Club of Queer Trades some time ago but I gave it a quick reread last night just to refresh my memory. Arthur Conan Doyle's The Return of Sherlock Holmes was published the same year as this book, combining several stories published between 1903 and 1904 following a huge backlash from readers when he killed off his great detective in 1893. I mention this because in Club of Queer Trades, Chesterton takes to the familiar Holmes and Watson-ish format to tell his own tales, following the adventures of detective Rupert Grant and Swinburne, the narrator of these tales, who is often dragged into Rupert's adventures. And then, there's Rupert's brother Basil who generally comes up with the real solution to Rupert's cases. The thing is that, when all is said and done, Chesterton has given us much more of a detective-story parody here, but it's parody with a purpose. "It is an eccentric and Bohemian Club, of which the absolute condition of membership lies in this, that the candidate must have invented the method by which he earns his living." "the Thugs set up a Strangers' Assassination Company in one of the great buildings in Norfolk Street, and sent in a mild man in spectacles to answer inquiries, no inquiries would be made." Exactly what oddball trades are involved in the Club I won't say, since a) they have to do with the short cases in this book and b) half the fun is in figuring out exactly what each might be as you're reading each story and once you get the pattern of these tales down in your head. What I will say is that as far as the actual detection that happens in this book, there are some clever conundrums to be found here. My favorite is the "Awful Reason of the Vicar's Visit," which not only presents a clever little mystery but also made me laugh out loud. And as far as the actual detective who is "solving" these cases, Rupert takes himself quite seriously, but he has a habit of never being right in his deductions and ends up deferring to Basil who has a way of seeing exactly what's going on in each situation. The law, morality, and society itself all come under scrutiny here, and what seems to be a lot of silliness actually has some serious purpose when all is said and done. The trick is that you have to get to the end of the book before actually discovering what that purpose really is. 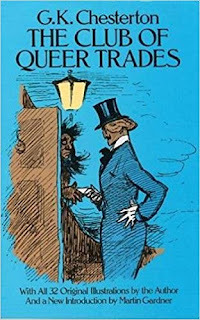 While it turned out to be anything but what I thought it might be, The Club of Queer Trades is actually a delightful and entertaining book. People who enjoy Chesterton's Father Brown mysteries (not the later TV versions but the short stories themselves) will find that same sense of understanding of human nature in this book but this one makes for a completely different sort of reading experience. It won't be for everyone, but it suited me just fine.